In October and November 2015 Heather began to suffer from headaches, blocked sinuses, a swelling on her forehead and short, frequent nosebleeds. This led to her being diagnosed with a heavy bout of Sinusitis at the GP’s and prescribed several different Antibiotics. Heather was taken into hospital on Christmas Day 2015 with a nose bleed that wouldn’t stop and to her shock and horror she was diagnosed with a substantial nasal and sinus tumour that had already cracked through her skull and was pushing against her brain. Five weeks later it was confirmed as malignant and inoperable. There was nothing they could do they said, with the expectation being that it could not be cured …. The following is an account of Heather’s journey in her own words…. After accepting the palliative radiotherapy on offer I, along with my husband, began to research alternative and supplemental treatments. Through a very fortunate turn of events we were introduced to Cancer Options and Patricia Peat. It was to turn out to be one of a few key introductions for us that ultimately influenced my fate. When receiving a prognosis as desperate as the one I received, a lifespan of three to twelve months, two key things get lost in the emotion that follows; control and hope. These were the things that we needed to get back and Cancer Options was instrumental in helping us to do just that. So, following our initial consultation with Patricia, and the production of an Integrative Care Plan, a substantial bespoke plan of action just for me, the first thing that Patricia advised was to have further tests to look into what might have caused the tumour. Wow, looking at what caused this thing with the accompanying logical extent of stopping its growth and potentially reducing it, made such sense. But we had only been talked to previously at the hospital about how best to ‘attack’ the tumour. Patricia made it so clear that a healthy, functioning immune system is equally, if not more important, than conventional ‘treatments’ when it comes to cancer. After a few months of being on the Cancer Options programme it was D-Day! It was time for a rescan, and to see what happens next from a conventional treatment perspective. The scan showed reduction in the tumour causing the hospital to declare the disease as stable. This was in itself great news but the surgeons local to us said that it remained inoperable, which left us feeling that we still needed to continue with our journey. So now we reviewed the supplements, added some, stopped a few and then we took my case to London for a full second opinion. We went to see a professor of Oncology on Harley Street. He was a wonderful man, immediately identifying treatment options that hadn’t been discussed before with us, but more importantly introducing us to a surgeon, who said he could operate and remove 100 percent of the tumour. We could hardly believe it! So at the end of September I went into Hospital, and underwent a five hour operation to have the entire tumour taken out. It was successful and three subsequent scans post operation have shown me as being clear of all tumours! So, whilst we are still very much on the ‘cancer journey’ we can look forward with far greater hope and a comforting feeling of control. Patricia is now working with me to realign the supplements to focus even more on optimising my immune system in a programme designed to minimise the chance of anything untoward returning! 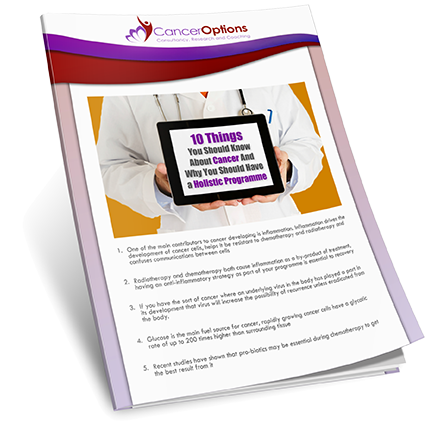 Take control of your own treatment plan. Always, have a Complimentary and Alternative Medical Practitioner (CAM) on your ‘team’ – this is what Cancer Option does so well. Look at what could have caused the cancer – tumours do not appear at random. There will always be an underlying reason. Do not be afraid to seek a second opinion. Think positively all the time! A positive outcome can be as much a self-fulfilling prophecy as a negative one.